MV Agusta has launched the F4 RC in India at Rs 50.35 lakh (ex-Pune). The exotic superbike's eye-watering price tag makes it one of the most expensive bikes on sale in India. The bike available in limited numbers only (250 units worldwide) and India gets only one. That makes it an instant collector's item. The F4 RC, where RC stands for Reparto Corse, is the lighter and faster version of the F4, and hand built by a team of specialists. The bike uses exotic materials in order to shed weight, one of the biggest problems that plagues the F4/F4R. The F4 RC only weighs 175kg, dry. The F4 RC uses magnesium covers for a few engine parts and 11 carbon-fibre parts and 333 titanium bolts that help it lose a few kilos. The engine too uses a lighter crankshaft. The bike also uses lighter, forged aluminium wheels that look fabulous. The track focus is also evident in the top-spec suspension on the F4 RC. Upfront are Ohlins NIX 30 forks with adjustments for spring-preload, compression and damping. At the rear, there's an Ohlins TTX 36 shock absorber which allows adjustment for compression and rebound damping. The F4 RC in street-spec gets all the above with the engine tuned to deliver 205PS at 13,600rpm and 111Nm at 9,600rpm. But that's not all. MV Agusta will also supply the race kit that will transform the F4 RC into a proper WSBK-spec replica. The kit comprises of a dedicated ECU by Magneti Marelli that, along with the Termignoni exhaust, bumps up the power to 212PS. 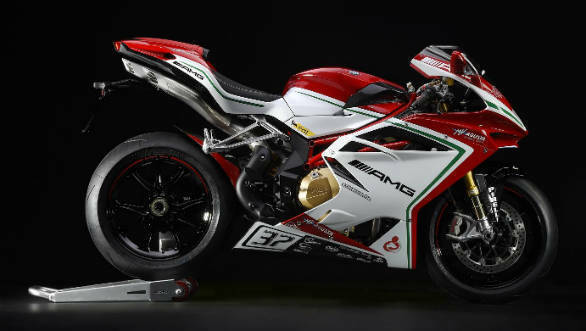 Besides the mechanical differences, the F4 RC uses the beautiful bodywork of the F4, although with a different set of graphics and the AMG moniker, indicating MV Agusta's association with the Mercedes-Benz's performance house in Affalterbach. At half a crore rupees, the MV Agusta F4 RC is beyond the reach of many people. But for the ones who can afford it, the F4 RC would be nothing short of ultimate in terms of Italian exotica.